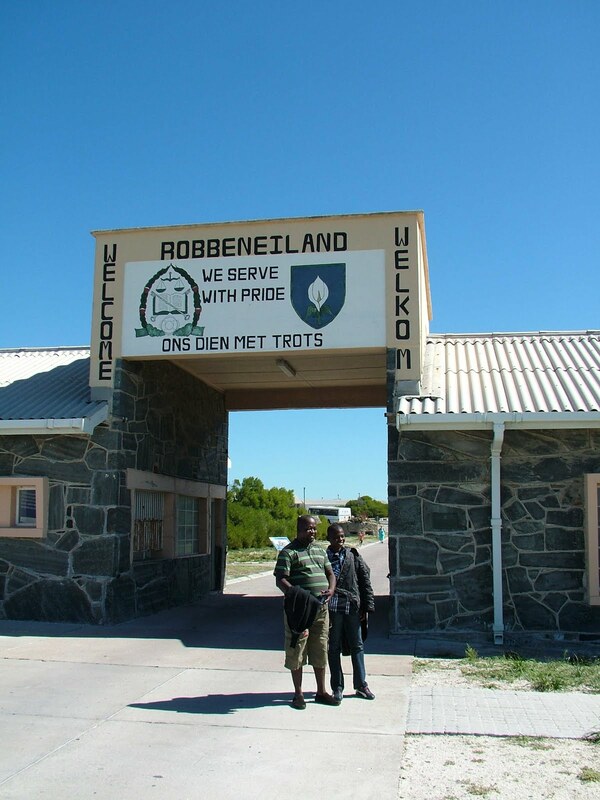 ROBBEN Island is a flat, featureless and seemingly insignificant dot in the ocean seven cold and windy kilometres off Cape Town, yet it is one of South Africa's foremost destinations for visitors. Today that cell has become a shrine for the thousands of visitors who shuffle past it and wonder how one man could not only survive, but actually strive forward in a place designed to crush the morale of those like himself fighting racist apartheid. 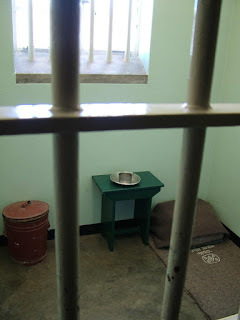 Nelson Mandela had been sentenced in 1963 to life here by South Africa's apartheid rulers, who were determined he would die behind its bars with fellow freedom fighter political prisoners. Now, with apartheid officially ended from April 1994, Robben Island has become a worldwide symbol of "the strength of the human spirit over adversity, suffering and injustice;" in 1997 it was declared a museum, and two years later a UNESCO World Heritage Site. Visitors today talk of the immense power it has over them as they take one of four daily tours of 3.5hrs of the island, including the half-hour boat trip across Table Bay from Cape Town's Victoria & Albert waterfront, with many speaking openly of the enormous impact of seeing what greeted every prisoner on Robben Island. And that's a concrete gateway still bearing the emblem of the apartheid prison service – and it's sickening apartheid-era motto: "We Serve With Pride". Buses operate guided tours of the island with its village, houses once used by apartheid prison staff, a modern-day prison, a garrison church and a cemetery. Lastly there's a walk-through of the original apartheid prison. 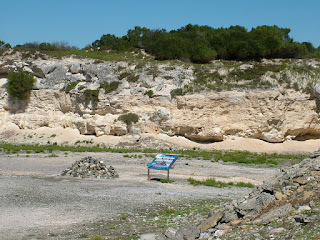 This includes the limestone quarry where Mandela and his fellow political prisoners toiled in the sun for up to eight hours a day, damaging their eyesight in the glare reflected from the white limestone. It was here, however, that they could, in secret, talk-the-talk that would shape a future nation. And the quarry includes a cairn that began with a single stone laid by Mandela on a reunion visit in 1995 on the anniversary of the 1991 closure of the political prison… with other former inmates who followed over the years adding their own individual stones to that cairn. 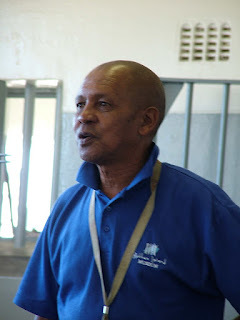 But the main interest for visitors is the drab concrete cell-block which held political prisoners for 30 years from 1961, and where one, Jama Mbatyoti, who spent five years of incarceration from the age of 19 for leading anti-apartheid student protests, is one of today's tour guides. Jama describes the hell of prison life, shows the cells, washrooms and communal centres, and tells how political prisoners were allowed one 30-minute visit and one letter every six months. And how anything deemed "political" in their letters would be cut out, so that often the prisoner received nothing more than an indecipherable remnant of tattered paper. And he shows Mandela's cell, furnished the way it had been when he was prisoner number 46664, with nothing but a bedroll on the cement floor, a tiny stool and a waste bin. Through the barred window Jama points out Mandela's garden where he grew vegetables – and hid cocoa tins which held the first draft of his autobiography, Long Walk To Freedom, written at night in his cell. Despite poor food, inadequate clothing in the wet and windswept Cape winter, and heavy labour in the island's limestone quarry, Mandela remained unbroken. "The challenge for every prisoner, particularly every political prisoner," he wrote, "is how to survive prison intact, how to emerge from prison undiminished, how to conserve and even replenish one's beliefs... The authorities' greatest mistake was to keep us together. For together we were able to support and gain strength from each other. 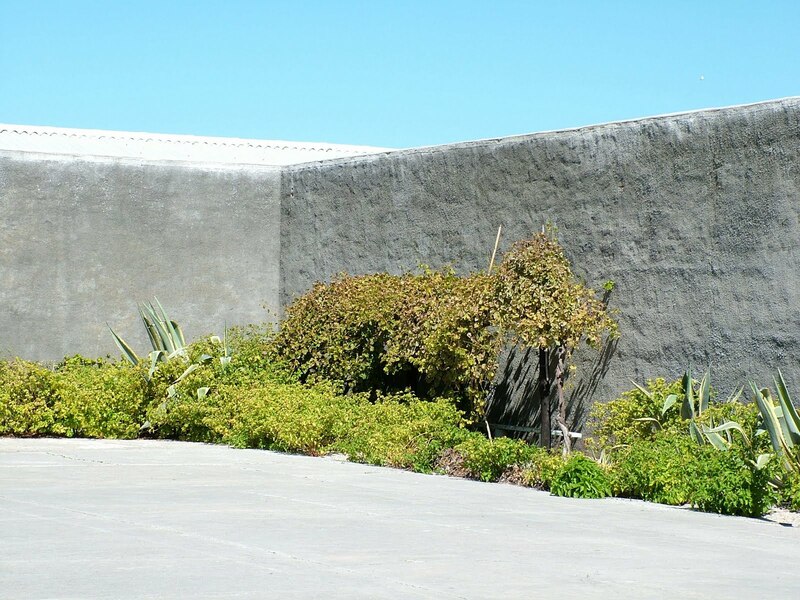 We shared whatever we knew and whatever we learned, and through sharing, we became stronger"
Aside from what's to be seen on the island, Robben Island Museum has a number of long-term exhibits at its admission-free mainland site at the V&A waterfront. THE tiny 2.4m X 2.1m (8ft X 7ft) cell that was home for Nelson Mandela for 18 of his 27 years as a political prisoner during South Africa's hated apartheid. 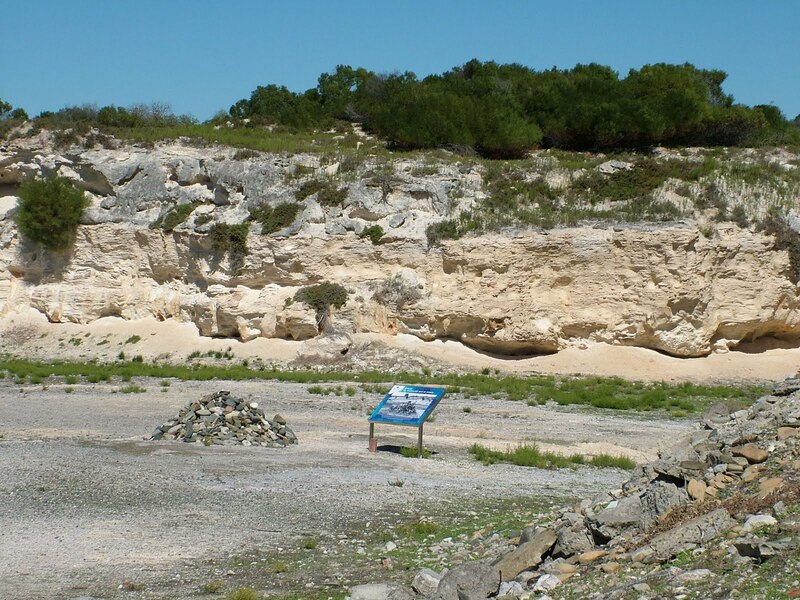 THE limestone quarry where Mandela and other political prisoners worked for up to eight hours a day. In the foreground is a stone cairn begun with a single stone placed by Mandela on a 1995 reunion. 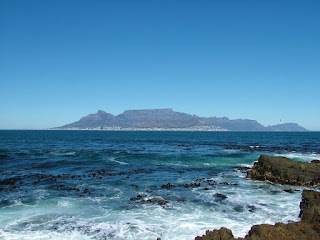 VIEW of Cape Town and Table Mountain seven kilometres away from Robben Island. TOUR guide today, Jama Mbatyoti was a political prisoner on Robben Island at just 19 years of age for leading a student protest against apartheid. 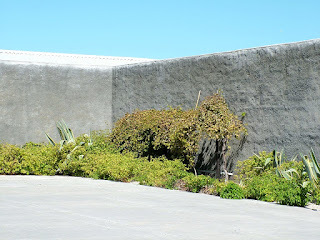 NELSON Mandela's vegetable garden inside the walls of the prison on Robben Island. He hid the draft of an autobiography, Long Walk To Freedom, inside tins buried in the garden. 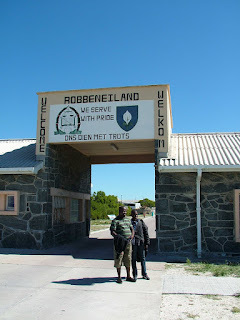 THE sight that greeted prisoners arriving on Robben Island: a concrete gateway with the emblem of the apartheid prison service and its motto "We Serve With Pride." Many visitors today speak openly of the sickening impact the sign has on them.